Our trips are customized for private travel. Below some of our customer’s favorites in Portugal. Availability may be limited. After your arrival to Porto + a strong Portuguese coffee or two, a private guided Porto walk and petiscos / tapas tasting. Porto is known for a fascinating mix of architecture, fine wines + old world charm. Later opt for sunset drinks seaside before dinner. We´ll hook you up at our fav places, not tourist traps. Experience Porto’s elegant cultural, historic, food & wine gems: Opt for a private cooking class with a chef and meal or private cultural touring of unique Romanesque cathedral, a cool bookstore that inspired J.K. Rowling´s Harry Potter, or exquisite port wine tastings. Explore Douro wine region: Opt for guided hiking on verdant terraced hills near the alluring Douro River and vineyards …. or guided boat excursion to discover this UNESCO World Heritage site. Winery visits and tastings can be arranged if desired. Romantic historic charms abound on a private excursion: Chaves, a Roman town with hand-carved wooden balconies and a medieval castle ready for Game of Thrones + the gorgeous old quarter of Guimaraes. Overnight in classic style in Vidago. Coimbra, the “Cambridge of Portugal” with one of Europe´s oldest universities. It was here that many of the elite of Portugal’s empire started. Tour the beautiful campus with our guide. Or the Royal “wedding gift” town of Obidos, a whimsical white-washed medieval town, gifted by Portuguese kings to their brides… Then on to cosmopolitan Lisbon with your driver. Wake up in luxury to Lisbon´s sensual colors, reminding of the exotic reach of Portugal´s former colonies. Later our fun expert guides you in historic Alfama district´s medieval lanes, epic vistas + St George Castle. Later taste petiscos (tapas), fine wines & cheeses. Private touring of Lisbon, depending on your taste: Bairro Baixa, or Bairro Alto districts or a Royal historic monastery, fine art or modern design …. Next, channel great world explorers like Magellan, do the Tagus River by private boat. Tonight feel the passion of soulful fado. Private excursion to Great Gatsby-like palaces of Sintra…. this region was like Casablanca during World War II, with Nazi and Allied spies going at it. Then a lovely alfresco seaside meal with panoramic sea views in Cascais. Return to Lisbon. 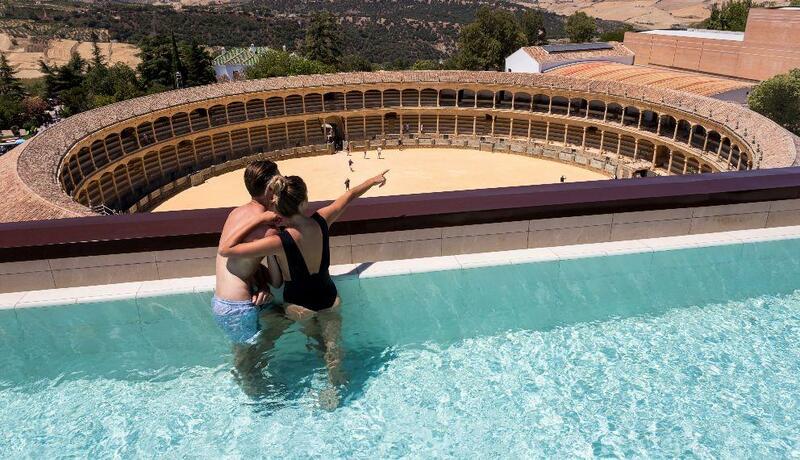 Private luxe transfer to UNESCO World Heritage Évora, a 2000-year-old Roman and medieval town. You enjoy modern suite in a historic property with ancient olive groves and full service spa. Opt to hike en route in the Arrabida Mountains before arrival. Évora with an insider: Roman Temple, eclectic medieval bone chapel, a singular fortress cathedral that survived Moorish attacks with our savvy guide. Later perhaps a tasting of regional cheeses & wines in medieval wine cellar. Experience “Iberian Stonehenge” prehistoric stone circles, dolmens, + quaint historic villages with hard-to-find artisan crafts (not made in China) or visit a traditional Portuguese country estate for a tour and traditional lunch. Citrus, olive oil, wine, cheese, and cork production are common here. The Algarve is a European favorite: sunny Mediterranean climate, scuba, surfing classes, mountain biking in the Monchique Mountains, private yacht or sailing charters, golfing, spas, golf, private touring + fine dining. Many opt for a private sailing or hiking adventure. Go gastronomic: uber-fresh seafood, artisan cheeses, Alentejo wines + the famous Piri-Piri, a tasty antioxidant-rich spice imported from Portugal s colonial empire holdings in Mozambique. It’s often served with the savory grilled meats and fish. Today opt for more active adventures or go cultural & historic: explore nearby Tavira, Lagos, Silves or Cape Sagres… Late afternoon private luxe transfer to Lisbon to your hotel. Private luxe airport transfer to Lisbon to make your flight connection easy. Magical Spain & Portugal luxury tours are customized for private travel.